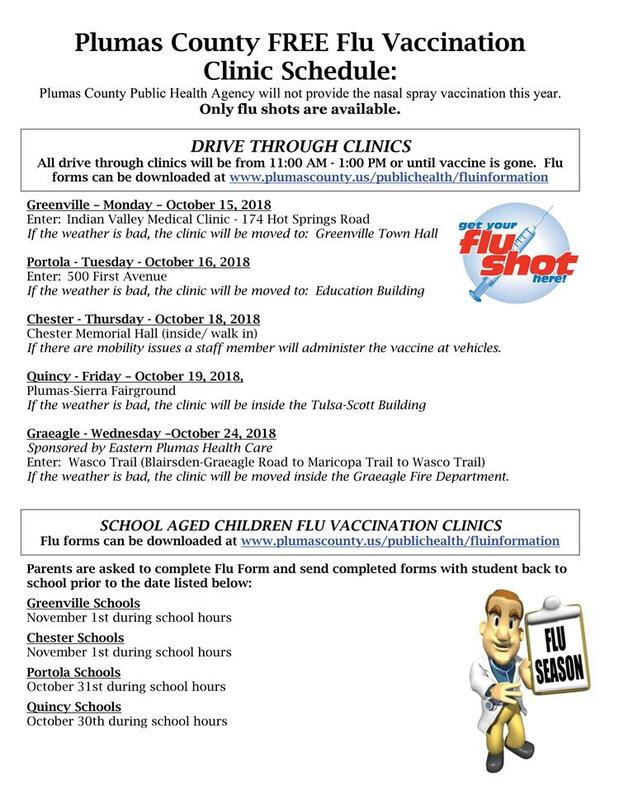 The Plumas County Public Health Agency provides FREE flu vaccine each fall through our Drive-Through and Walk-in clinics, or by appointment call the Public Health clinic at (530) 283-6330. 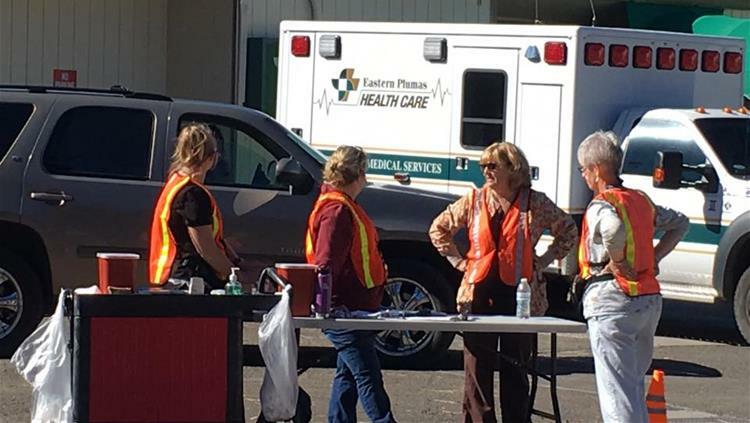 Plumas County Public Health Agency will not provide the nasal spray vaccination this year. Only flu shots are available. Vaccination will be given on a first-come, first served basis. Be sure to wear clothing that allows vaccination to your upper arm. The vaccine is appropriate for adults and children age 3 and up. Pregnant women should contact their doctor regarding vaccination. Influenza, or "the flu," is a leading cause of illness in the United States and can lead to serious medical conditions, hospitalization or even death. The flu is caused by the influenza virus, which infects the nose, throat, and lungs. Flu seasons are unpredictable. They can begin early in the fall and last late into the spring. Influenza is extremely contagious and spreads very easily. The best way to protect oneself from the flu is by getting an annual flu vaccine as soon as it becomes available. Cover your nose and mouth with a tissue when you cough or sneeze and throw the tissue in the trash after you use it. Stay home when you are ill and try to limit contact with others as much as possible to keep from infecting them. Make sure you get plenty of rest and drink a lot of fluids. Stay away from others as much as possible so you don't spread the flu. You should stay home from school or work until you have been fever free for at least 24 hours. If you have special conditions, for example, diabetes, asthma, emphysema or heart disease, contact your doctor to be safe. Some people are more likely to get flu complications - for example young children, people 65 and older, people with asthma, diabetes or women who are pregnant - and they should talk to a health-care provider about whether they need to be examined if they are experiencing flu-like symptoms. Also, it's possible for healthy people to develop severe illness from the flu, so anyone concerned about their illness should consult a healthcare provider.